This CSS3 module defines properties for text manipulation and specifies their processing model. It covers line breaking, justification and alignment, white space handling, text decoration and text transformation. This CSS module has been produced as a combined effort of the W3C Internationalization Activity, and the Style Activity and is maintained by the CSS Working Group. It also includes contributions made by participants in the XSL Working Group (members only). Feedback on this draft should be posted to the (archived) public mailing list www-style@w3.org (see instructions) with [css3-text] in the subject line. You are strongly encouraged to complain if you see something stupid in this draft. The editors will do their best to respond to all feedback. If you have implemented properties from the May 2003 CSS3 Text CR please let us know so we can take that into account as we redraft the spec. You can post to www-style (public), post to the CSS WG mailing list (Member-restricted), or email fantasai directly (personal). This draft describes features that are specific to certain scripts. There is an ongoing discussion about where these features belong: in existing CSS properties, in new CSS properties, or perhaps in other specifications. This module replaces and extends the text-level features defined in [CSS21] chapter 16. A grapheme cluster is what a language user considers to be a character or a basic unit of the script. The term is described in detail in the Unicode Technical Report: Text Boundaries [UAX29]. This specification uses the extended grapheme cluster definition in [UAX29] (not the legacy grapheme cluster definition). The UA may further tailor the definition as allowed by Unicode. Within this specification, the ambiguous term character is used as a friendlier synonym for grapheme cluster. See Characters and Properties for how to determine the Unicode properties of a character. Puts the first character of each word in titlecase; other characters are unaffected. Puts all characters in uppercase. Puts all characters in lowercase. Puts all characters in fullwidth form. If the character does not have a corresponding fullwidth form, it is left as is. This value is typically used to typeset Latin characters and digits like ideographic characters. Converts all small Kana characters to normal Kana. This value is typically used for ruby annotation text, where all small Kana should be drawn as large Kana. The definition of "word" used for ‘capitalize’ is UA-dependent; [UAX29] is suggested (but not required) for determining such word boundaries. Authors should not expect ‘capitalize’ to follow language-specific titlecasing conventions (such as skipping articles in English). The definition of fullwidth and halfwidth forms can be found on the Unicode consortium web site at [UAX11]. The mapping to fullwidth form is defined by taking code points with the <wide> tag in their Decomposition_Mapping in [UAX44] and mapping their decomposition (minus the <wide> tag) back to the original code point. The mappings for small Kana to normal Kana are defined in Small Kana Mappings. Text transformation happens after white space processing, which means that ‘full-width’ transforms only preserved U+0020 spaces to U+3000. All-caps text sometimes has special typographic considerations. For example: Punctuation and number glyphs might be adjusted for the higher "center of gravity" (see the case feature in OpenType). Should we turn that on by default, as they suggest? Or spacing might be adjusted for the increased visual weight of the glyphs (see the cpsp feature in OpenType). Should we turn that on when ‘letter-spacing’ is ‘normal’? A more complicated problem is the greek uppercasing rules which actually alter the diacritics. How should we handle that? A future level of CSS may introduce the ability to create custom mapping tables for less common text transforms, such as by ‘@text-transform’ rule similar to ‘@counter-style’ from [CSS3LIST]. The source text of a document often contains formatting that is not relevant to the final rendering: for example, breaking the source into segments (lines) for ease of editing or adding white space characters such as tabs and spaces to indent the source code. CSS white space processing allows the author to control interpretation of such formatting: to preserve or collapse it away when rendering the document. In the document source, segments can be delimited by carriage returns (U+000D), linefeeds (U+000A) or a combination (U+000D U+000A), or by some other mechanism, such as the SGML RECORD-START and RECORD-END tokens. If no segmentation rules are specified for the document language, each line feed (U+000A), carriage return (U+000D) and CRLF sequence (U+000D U+000A) in the text is considered a segment break. (This default rule also applies to generated content.) In CSS, each such segment break is treated as a single line feed character (U+000A). White space processing in CSS interprets white space characters only for rendering: it has no effect on the underlying document data. Note that the document parser may have not only normalized segment breaks, but also collapsed other space characters or otherwise processed white space according to markup rules. Because CSS processing occurs after the parsing stage, it is not possible to restore these characters for styling. Therefore, some of the behavior specified below can be affected by these limitations and may be user agent dependent. Control characters (Unicode class Cc) other than tab (U+0009), line feed (U+000A), space (U+0020), and the bidi formatting characters (U+202x) should be rendered as invisible zero-width characters. UAs may instead treat them as visible characters. (Note, however, that this will usually result in them being rendered as missing glyphs.) What's the line-breaking behavior? Effects on joining? Can we just copy the behavior of some zero-width Unicode character? This section is still under discussion and may change in future drafts. This value directs user agents to collapse sequences of white space into a single character (or in some cases, no character). This value prevents user agents from collapsing sequences of white space. Line feeds are preserved as forced line breaks. This value collapses white space as for ‘collapse’, but preserves line feeds as forced line breaks. This value directs user agents to "discard" all white space in the element. For block containers this value directs UAs to discard all whitespace at the beginning of the element up to and including the last line feed before the first non-white-space character in the element as well as to discard all white space at the end of the element starting with the first line feed after the last non-white-space character in the element. For other elements this value directs UAs to discard all whitespace at the beginning and end of the element. This value directs the UA to collapse all collapsible whitespace immediately before the start of the element. This value directs the UA to collapse all collapsible whitespace immediately after the end of the element. It's been pointed out that ‘trim-inner’, ‘consume-before’, and ‘consume-after’ won't work well because ‘text-space-collapse’ is inherited, meaning that inserting a <span> or >div> would cause more white space to be removed than otherwise. This property determines the measure of the tab character (U+0009) when rendered. Integers represent the measure in space characters (U+0020). Negative integers are not allowed. White space processing affects only spaces (U+0020), tabs (U+0009), and (post-normalization) line feeds (U+00A0). All spaces and tabs immediately preceding or following a line feed character are removed. If ‘text-space-collapse’ is not ‘preserve-breaks’, line feed characters are transformed for rendering according to the line feed transformation rules. Every tab is converted to a space (U+0020). Any space immediately following another collapsible space —even one outside the boundary of the inline—is removed. However, if removing this space would eliminate a line breaking opportunity in the text, that opportunity is still considered to exist. A collapsible space immediately preceding an element with ‘consume-before’ is removed. Such removed spaces do not indicate a line breaking opportunity in the text. Any collapsible spaces after the end of an element with ‘consume-after’ are removed. Such removed spaces do not indicate a line breaking opportunity in the text. If ‘text-space-collapse’ is set to ‘preserve’, any sequence of spaces unbroken by an element boundary is treated as a sequence of non-breaking spaces. However, a line breaking opportunity exists at the end of the sequence. If ‘text-space-collapse’ is set to ‘discard’, the first white space character in every white space sequence is converted to a zero width non-joiner (U+200C) and the rest of the sequence is removed. Then, the entire block is rendered. Inlines are laid out, taking bidi reordering into account, and wrapping as specified by the ‘text-wrap’ property. A sequence of collapsible spaces at the beginning of a line is removed. Each tab is rendered as a horizontal shift that lines up the start edge of the next glyph with the next tab stop. Tab stops occur at points that are multiples of the width of a space (U+0020) rendered in the block's font from the block's starting content edge. How many spaces is given by the ‘tab-size’ property. A sequence of collapsible spaces at the end of a line is removed. If spaces or tabs at the end of a line are non-collapsible but have ‘text-wrap’ set to ‘normal’ or ‘avoid’ the UA may visually collapse their character advance widths. White space that was not removed during the white space processing steps is called preserved white space. Note that there are two spaces between A and B, and none between B and C. This is best avoided by putting spaces outside the element instead of just inside the opening and closing tags and, where practical, by relying on implicit bidirectionality instead of explicit embedding levels. When line feeds are collapsible, they are either transformed into a space (U+0020) or removed depending on the context before and after the line break. Note that the white space processing rules have already removed any tabs and spaces after the line feed before these checks take place. If the character immediately before or immediately after the line feed is the zero width space character (U+200B), then the line feed is removed. Otherwise, if the East Asian Width property [UAX11] of both the character before and after the line feed is F, W, or H (not A), and neither side is Hangul, then the line feed is removed. Otherwise, the line feed is converted to a space (U+0020). Comments on how well this would work in practice would be very much appreciated, particularly from people who work with Thai and similar scripts. Consecutive white space collapses into a single space. A sequence of newlines and other white space between two Chinese, Japanese, or Yi characters collapses into nothing. A zero width space before or after a white space sequence containing a newline causes the entire sequence of white space to collapse into a zero width space. In most writing systems, in the absence of hyphenation a line break occurs only at word boundaries. Many writing systems use spaces or punctuation to explicitly separate words, and line break opportunities can be identified by these characters. Scripts such as Thai, Lao, and Khmer, however, do not use spaces or punctuation to separate words. Although the zero width space (U+200B) can be used as an explicit word delimiter in these scripts, this practice is not common. As a result, a lexical resource is needed to correctly identify break points in such texts. In several other writing systems, (including Chinese, Japanese, Yi, and sometimes also Korean) a line break opportunity is based on character boundaries, not word boundaries. In these systems a line can break anywhere except between certain character combinations. Additionally the level of strictness in these restrictions can vary with the typesetting style. CSS does not fully define where line breaking opportunities occur, however some controls are provided to distinguish common variations. Further information on line breaking conventions can be found in [JLREQ] and [JIS4051] for Japanese, [ZHMARK] for Chinese, and in [UAX14] for all scripts in Unicode. Any guidance for appropriate references here would be much appreciated. Floated and absolutely-positioned elements do not introduce a line breaking opportunity. The line breaking behavior of a replaced element is equivalent to that of a Latin character. It is not clear whether this section handles Southeast Asian scripts well. Additionally, some guidance should be provided on how to break or not break Southeast Asian in the absence of a dictionary. The UA determines the set of line-breaking restrictions to use, and it may vary the restrictions based on the length of the line; e.g., use a less restrictive set of line-break rules for short lines. Breaks text using the least restrictive set of line-breaking rules. Typically used for short lines, such as in newspapers. Breaks text using the most common set of line-breaking rules. Breaks text using the most stringent set of line-breaking rules. In CSS3 no distinction is made among the levels of strictness in non-CJK text: only CJK codepoints are affected, unless the text is marked as Chinese or Japanese, in which case some additional common codepoints are affected. However a future level of CSS may add behaviors affecting non-CJK text. Support for this property is optional. It is recommended for UAs that wish to support CJK typography and strongly recommended for UAs in the Japanese market. The CSSWG recognizes that in a future edition of the specification finer control over line breaking may be necessary to satisfy high-end publishing requirements. Break lines according to their usual rules. Lines may break between any two characters within words. Hyphenation is not applied. This option is used mostly in a context where the text is predominantly using CJK characters with few non-CJK excerpts and it is desired that the text be better distributed on each line. Lines may break only at word separators and other explicit break opportunities. Otherwise this option is equivalent to ‘normal’. This option is mostly used where the presence of word separator characters still creates line-breaking opportunities, as in Korean. When shaping scripts such as Arabic are allowed to break within words due to ‘break-all’, the characters must still be shaped as if the word were not broken. Hyphenation allows the controlled splitting of words to improve the layout of paragraphs. CSS3 Text does not define the exact rules for hyphenation, but defines six properties and an at-rule that influence hyphenation. Whether hyphenation is applied can controlled with the ‘hyphens’ property. Nonetheless, UAs are strongly encouraged to optimize their line-breaking implementation to choose good break points and appropriate hyphenation points. These controls are optional because for a low-end implementation of hyphenation, they are not critical enough; and for a high-end implementation of paragraph breaking (such as in Teχ) they are not considered especially useful. Hyphenation opportunities are not considered when calculating ‘min-content’ intrinsic sizes. Words are not broken at line breaks, even if characters inside the word suggest line break points. Words are only broken at line breaks where there are characters inside the word that suggest line break opportunities. Characters can be explicit or conditional. In HTML, &shy; represents the soft hyphen character which suggests a line break opportunity. Words can be broken at appropriate hyphenation points either as determined by hyphenation characters inside the word or as determined automatically by a language-appropriate hyphenation resource (such as those provided via ‘@hyphenation-resource’). Conditional hyphenation characters inside a word, if present, take priority over automatic resources when determining hyphenation points within the word. Correct automatic hyphenation requires a hyphenation resource appropriate to the language of the text being broken. The UA is therefore only required to automatically hyphenate text for which the author has declared a language (e.g. via HTML lang or XML xml:lang) and for which it has an appropriate hyphenation resource. When shaping scripts such as Arabic are allowed to break within words due to hyphenation, the characters must still be shaped as if the word were not broken. This property specifies strings that are shown between parts of hyphenated words. The ‘auto’ value means that the user agent should find an appropriate value. If a string is specified, it appears at the end of the line before a hyphenation break. Both hyphens triggered by automatic hyphenation and hyphens triggered by soft hyphens are rendered according to ‘hyphenate-character’. Can we point to CLDR for hyphenation character data? Is ‘hyphenate-limit-zone’ a good name? Comments/suggestions? This property specifies the maximum amount of unfilled space (before justification) that may be left in the line box before hyphenation is triggered to pull part of a word from the next line back up into the current line. This property specifies the minimum number of characters in a hyphenated word. If the word does not meet the required minimum number of characters in the word / before the hyphen / after the hyphen, then the word must not be hyphenated. Nonspacing combining marks (Unicode class) and intra-word punctuation (Unicode classes P*) do not count towards the minimum. If three values are specified, the first value is the required minimum for the total characters in a word, the second value is the minimum for characters before the hyphenation point, and the third value is the minimum for characters after the hyphenation point. If the third value is missing, it is the same as the second. If the second value is missing, then it is ‘auto’. The ‘auto’ value means that the UA chooses a value that adapts to the current layout. Unless the UA is able to calculate a better value, it is suggested that ‘auto’ means 2 for before and after, and 5 for the word total. In the example below, the minimum size of a hyphenated word is left to the UA (which means it may vary depending on the language, the length of the line, or other factors), but the minimum number of characters before and after the hyphenation point is set to 3. This property indicates the maximum number of successive hyphenated lines in an element. The ‘no-limit’ value means that there is no limit. In some cases, user agents may not be able to honor the specified value. (See ‘overflow-wrap’.) It is not defined whether hyphenation introduced by such emergency breaking influences nearby hyphenation points. The last full line of the element, or the last line before any column, page, or spread break inside the element should not be hyphenated. The last line before any column, page, or spread break inside the element should not be hyphenated. The last line before page or spread break inside the element should not be hyphenated. The last line before any spread break inside the element should not be hyphenated. Lines may break at allowed break points, as determined by the line-breaking rules in effect. Line breaking behavior defined for the WJ, ZW, and GL line-breaking classes in [UAX14] must be honored. Lines may not break; text that does not fit within the block container overflows it. Line breaking is suppressed within the element: the UA may only break within the element if there are no other valid break points in the line. If the text breaks, line-breaking restrictions are honored as for ‘normal’. Regardless of the ‘text-wrap’ value, lines always break at forced breaks: for all values, line-breaking behavior defined for the BK, CR, LF, CM NL, and SG line breaking classes in [UAX14] must be honored. When ‘text-wrap’ is set to ‘normal’ or ‘avoid’, UAs that allow breaks at punctuation other than spaces should prioritize breakpoints. For example, if breaks after slashes have a lower priority than spaces, the sequence "check /etc" will never break between the ‘/’ and the ‘e’. The UA may use the width of the containing block, the text's language, and other factors in assigning priorities. As long as care is taken to avoid such awkward breaks, allowing breaks at appropriate punctuation other than spaces is recommended, as it results in more even-looking margins, particularly in narrow measures. The priority of breakpoints can be set to reflect the intended grouping of text. Lines may break only at allowed break points. However, the restrictions introduced by ‘word-break: keep-all’ may be relaxed to match ‘word-break: normal’ and the various hyphenation limit properties may be ignored if there are no otherwise-acceptable break points in the line. An unbreakable "word" may be hyphenated if there are no otherwise-acceptable break points in the line even if hyphenation is turned off or otherwise restricted. Hyphenation controls may influence where the word breaks, but cannot forbid the word from hyphenating to prevent overflow. An unbreakable "word" may be broken at an arbitrary point if there are no otherwise-acceptable break points in the line. Shaping characters are still shaped as if the word were not broken, and grapheme clusters must together stay as one unit. If specified together with ‘hyphenate’, valid hyphenation takes precedence over ‘break-word’ breaking. Break opportunities not part of ‘overflow-wrap: normal’ line breaking are not considered when calculating ‘min-content’ intrinsic sizes. For legacy reasons, UAs may also accept ‘word-wrap’ as an alternate name for the ‘overflow-wrap’ property. However this syntax not valid. The inline contents are aligned to the start edge of the line box. The inline contents are aligned to the end edge of the line box. The inline contents are aligned to the left edge of the line box. In vertical text, ‘left’ aligns to the edge of the line box that would be the start edge for left-to-right text. The inline contents are aligned to the right edge of the line box. In vertical text, ‘right’ aligns to the edge of the line box that would be the end edge for left-to-right text. The text is justified according to the method specified by the ‘text-justify’ property. The string must be a single character; otherwise the declaration must be ignored. When applied to a table cell, specifies the alignment character around which the cell's contents will align. See below for further details. This value behaves the same as ‘inherit’ except that an inherited ‘start’ or ‘end’ keyword is calculated against its parent's ‘direction’ value and results in a computed value of either ‘left’ or ‘right’. If two keywords are given in combination, then the first value specifies the alignment of the first line and any line immediately after a forced line break; and the second value specifies the alignment of any remaining lines. A block of text is a stack of line boxes. In the case of ‘start’, ‘end’, ‘left’, ‘right’ and ‘center’, this property specifies how the inline-level boxes within each line box align with respect to the start and end sides of the line box: alignment is not with respect to the viewport or containing block. In the case of ‘justify’, the UA may stretch or shrink any inline boxes by adjusting their text in addition to shifting their positions. (See also ‘text-justify’, ‘letter-spacing’, and ‘word-spacing’.) If an element's white space is set to be collapsible, then the UA is not required to adjust its text for the purpose of justification and may instead treat the text as having no expansion opportunities. If the UA chooses to adjust the text, then it must ensure that tab stops continue to line up as required by the white space processing rules. If the alignment character appears more than once in the text, the first instance is used for alignment. If the alignment character does not appear in a cell at all, the string is aligned as if the alignment character had been inserted at the end of its contents. Character-based alignment occurs before table cell width computation so that auto width computations can leave enough space for alignment. Whether column-spanning cells participate in the alignment prior to or after width computation is undefined. If width constraints on the cell contents prevent full alignment throughout the column, the resulting alignment is undefined. when character-based alignment is applied to boxes that are not table cells. when the text wraps to multiple lines (at unforced break points). when the column is wide enough that the character alignment alone does not determine the positions of its character-aligned contents. In this case the keyword alignment of the first cell in the column with a specified alignment character is used to slide the position of the character-aligned contents to match the keyword alignment insofar as possible without changing the width of the column. For ‘center’, the UA may center the aligned contents using its extremes, center the alignment axis itself (insofar as possible), or optically center the aligned contents some other way (such as by taking a weighted average of the extent of the cells' contents to either side of the axis). when a character-aligned cell spans more than one column. In this case the keyword alignment value is used to determine which column's axis to align with: the leftmost column for ‘left’, the rightmost column for ‘right’ and ‘center’, the startmost column for ‘start’, the endmost column for ‘end’. Right alignment is used by default for character-based alignment because numbering systems are almost all left-to-right even in right-to-left writing systems, and the primary use case of character-based alignment is for numerical alignment. This property describes how the last line of a block or a line right before a forced line break is aligned. If a line is also the first line of the block or the first line after a forced line break, then ‘text-align-last’ takes precedence over ‘text-align’ except when two keywords are given for ‘text-align’ (i.e. when ‘text-align’ assigns an explicit first line alignment). ‘auto’ is equivalent to the value of the ‘text-align’ property except when ‘text-align’ is set to ‘justify’, in which case it is ‘justify’ when ‘text-justify’ is ‘distribute’ and ‘start’ otherwise. All other values have the same meanings as in ‘text-align’. The UA determines the justification algorithm to follow, based on a balance between performance and adequate presentation quality. One possible algorithm is to determine the behavior based on the language of the paragraph: the UA can then choose appropriate value for the language, like ‘inter-ideograph’ for CJK, or ‘inter-word’ for English. Another possibility is to use a justification method that is a universal compromise for all scripts, e.g. the ‘inter-cluster’ method with block scripts raised to first priority. Justification is disabled. This value is intended for use in user stylesheets to improve readability or for accessibility purposes. Justification primarily changes spacing at word separators. This value is typically used for languages that separate words using spaces, like English or Korean. Justification primarily changes spacing at word separators and between characters in block scripts. This value is typically used for CJK languages. Justification primarily changes spacing at word separators and between characters in clustered scripts. This value is typically used for Southeast Asian scripts such as Thai. Justification primarily changes spacing both at word separators and between characters in all scripts equally (except those in the connected and cursive categories). This value is sometimes used in e.g. Japanese. When justifying text, the user agent takes the remaining space between the ends of a line's contents and the edges of its line box, and distributes that space throughout its contents so that the contents exactly fill the line box. If the ‘letter-spacing’ and ‘word-spacing’ property values allow it, the user agent may also distribute negative space, putting more content on the line than would otherwise fit under normal spacing conditions. The exact justification algorithm is UA-dependent; however, CSS provides some general guidelines which should be followed when any justification method other than ‘auto’ is specified. CSS defines expansion opportunities as points where the justification algorithm may alter spacing within the text. These expansion opportunities fall into priority levels as defined by the justification method. Within a line, expansion and compression should primarily target the first-priority expansion opportunities; lower priority expansion opportunities are adjusted at a lower priority as needed. The expansion opportunity priorities for values of ‘text-justify’ are given in the table below. Since justification behavior varies by writing system, expansion opportunities are organized by script categories. An expansion opportunity exists between two letters at a priority level when at least one of them belongs to a script category at that level and the other does not belong to a higher priority level. All scripts in the same priority level must be treated exactly the same. Word separators (spaces) and other symbols and punctuation are treated specially, see below. * The ‘auto’ column defined above is informative; it suggests a prioritization that presents a universal compromise among justification methods. The spaces category represents expansion opportunities at word separators. (See ‘word-spacing’.) The UA may treat spaces differently than other expansion points in the same priority, but must not change their priority with respect to expansion points in other priority levels. For example, in Japanese ‘inter-ideograph’ justification (which treats CJK characters at a higher priority than Latin characters), word spaces traditionally have a higher priority than inter-CJK spacing, and the UA may split the 1st-priority level to implement that. However the UA is not allowed to drop spaces to the same priority as Latin characters. The symbols category represents the expansion opportunities existing at or between any pair of characters from the Unicode Symbols (S*) and Punctuation (P*) classes and at enabled autospace points. The default justification priority of these points is given above. However, there may be additional rules controlling their justification behavior due to typographic tradition. Therefore, the UA may reassign specific characters or introduce additional levels of prioritization to handle expansion opportunities involving symbols and punctuation. For example, there are traditionally no expansion opportunities between consecutive EM DASH U+2014, HORIZONTAL BAR U+2015, HORIZONTAL ELLIPSIS U+2026, or TWO DOT LEADER U+2025 characters [JLREQ]; thus a UA might assign these characters to the "never" prioritization level. As another example, certain fullwidth punctuation characters are considered to contain an expansion opportunity (see ‘text-spacing’). The UA might therefore assign these characters to a higher prioritization level than the opportunities between ideographic characters. For justification of cursive scripts, words may be expanded through kashida elongation or other cursive expansion processes. Kashida may be applied in discrete units or continuously, and the prioritization of kashida points is UA-dependent: for example, the UA may apply more at the end of the line. The UA should not apply kashida to fonts for which it is inappropriate. It may instead rely on other justification methods that lengthen or shorten Arabic segments (e.g. by substituting in swash forms or optional ligatures). Because elongation rules depend on the typeface style, the UA should rely on on the font whenever possible rather than inserting kashida based on a font-independent ruleset. The UA should limit elongation so that, e.g. in multi-script lines a short stretch of Arabic will not be forced to soak up too much of the extra space by itself. If the UA does not support cursive elongation, then, as with connected scripts, no expansion points exist between characters of these scripts. The UA may enable or break optional ligatures or use other font features such as alternate glyphs or glyph compression to help justify the text under any method. This behavior is not controlled by this level of CSS. Add example of using ‘text-justify’ with the TeX algorithm. 3.8 Line Adjustment in [JLREQ] gives an example of a set of rules for how a text formatter can justify Japanese text. It describes rules for cases where the ‘text-justify’ property is ‘inter-ideograph’ and the ‘text-spacing’ property does not specify ‘no-compress’. It produces an effect similar to cases where the computed value of ‘text-spacing’ property does not specify ‘trim-end’ or ‘space-end’. If the UA wants to prohibit this behavior, rule b. of 3.8.3 should be omitted. Note that the rules described in the document specifically target Japanese. Therefore they may produce non-optimal results when used to justify other languages such as English. To make the rules more applicable to other scripts, the UA could, for instance, omit the rule to compress half-width spaces (rule a. of 3.8.3). Specifies the normal optimum/minimum/maximum spacing, as defined by the current font and/or the user agent. Normal spacing should be percentage-based. Normal minimum and maximum spacing must be based on the optimum spacing so that the minimum and maximum limits increase and decrease with changes to the optimum spacing. Normal minimum and maximum spacing may also vary according to some measure of the amount of text on a line (e.g. block width divided by font size): larger measures can accommodate tighter spacing constraints. Normal optimum/minimum/maximum spacing may also vary based on the value of the ‘text-justify’ property, the element's language, and other factors. Normal minimum, maximum, and optimal spacing between a pair of connected or cursive characters is always zero. Specifies extra spacing in addition to the normal spacing. Percentages are with respect to the width of the affected character. Values may be negative, but there may be implementation-dependent limits. This property specifies the minimum, maximum, and optimal spacing between words. If only one value is specified, then it represents the optimal spacing and the minimum and maximum are both ‘normal’. If two values are specified, then the first represents both the optimal spacing and the minimum spacing, and the second represents the maximum spacing. If three values are specified, they represent the optimum, minimum, and maximum respectively. In the absence of justification the optimal spacing must be used. The text justification process may alter the spacing from its optimum (see the ‘text-justify’ property, above) but must not violate the minimum spacing limit and should also avoid exceeding the maximum. Spacing is applied to each word-separator character left in the text after the white space processing rules have been applied and should be applied half on each side of the character. This is correct for Ethiopian and doesn't matter for invisible spaces, but is it correct for Tibetan? Most publications seem to add space after the tsek mark during justification. Word-separator characters include the space (U+0020), the no-break space (U+00A0), the Ethiopic word space (U+1361), the Aegean word separators (U+10100,U+10101), the Ugaritic word divider (U+1039F), and the Tibetan tsek (U+0F0B, U+0F0C). Is this list correct? If there are no word-separator characters, or if the word-separating character has a zero advance width (such as the zero width space U+200B) then the user agent must not create an additional spacing between words. General punctuation and fixed-width spaces (such as U+3000 and U+2000 through U+200A) are not considered word-separators. This property specifies the minimum, maximum, and optimal spacing between characters. If only one value is specified, then it represents all three values. If two values are specified, then the first represents both the optimal spacing and the minimum spacing, and the second represents the maximum spacing. If three values are specified, they represent the optimum, minimum, and maximum respectively. In the absence of justification the optimal spacing must be used. The text justification process may alter the spacing from its optimum (see the ‘text-justify’ property, above) but must not violate the minimum spacing limit and should also avoid exceeding the maximum. Letter-spacing is applied in addition to any word-spacing. ‘normal’ optimum letter-spacing is typically zero. Letter-spacing must not be applied at the beginning or at the end of a line. At element boundaries, the letter spacing is given by and rendered within the innermost element that contains the boundary. UAs may apply letter-spacing to cursive scripts. In this case, UAs should extend the space between disjoint characters as specified above and extend the visible connection between cursively connected characters by the same amount (rather than leaving a gap). The UA may use glyph substitution or other font capabilities to spread out the letters. If the UA cannot expand a cursive script without breaking the cursive connections, it should not apply letter-spacing between characters of that script at all. When the resulting space between two characters is not the same as the default space, user agents should not use optional ligatures. Specifies the baseline behavior, equivalent to ‘space-start allow-end trim-adjacent’. Turns off all text-spacing features. All fullwidth characters are set with full-width glyphs. Creates extra non-breaking spacing around punctuation as required by language-specific typographic conventions. In this level, if the element's content language is French, narrow no-break space (U+202F) and no-break space (U+00A0) is be inserted where required by French typographic guidelines. Otherwise this value has no effect. However future specifications may add automatic spacing behavior for other languages. Set fullwidth opening punctuation with full-width glyphs (spaced) at the start of each line. Set fullwidth opening punctuation with half-width glyphs (flush) at the start of each line. Set fullwidth closing punctuation with half-width glyphs (flush) at the end of each line if it does not otherwise fit prior to justification, otherwise sets the punctuation with full-width glyphs. Set fullwidth closing punctuation with half-width glyphs (flush) at the end of each line. Set fullwidth opening punctuation with full-width glyphs (spaced) when not at the start of the line. Set fullwidth closing punctuation with full-width glyphs (spaced) when not at the end of the line. Collapse spacing between punctuation glyphs as described below. Justification may not compress text-spacing. (If this value is not specified, the justification process may reduce autospacing except when the spacing is at the start or end of the line.) 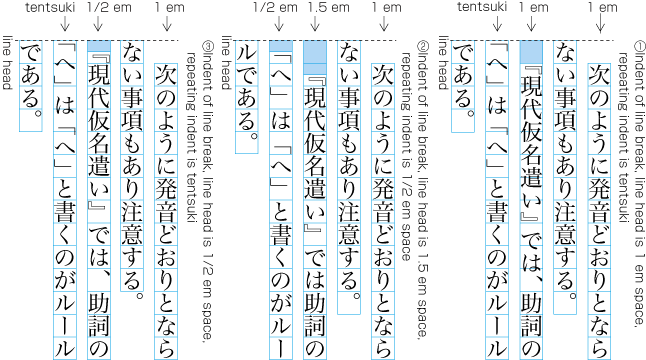 An example of compression rules is given for Japanese in 3.8 Line Adjustment in [JLREQ]. This property is additive with the ‘word-spacing’ and ‘letter-spacing’ properties. That is, the amount of spacing contributed by the ‘letter-spacing’ setting (if any) is added to the spacing created by ‘text-spacing’. The same applies to ‘word-spacing’. At element boundaries, the amount of extra spacing introduced between characters is determined by and rendered within the innermost element that contains the boundary. If the extra spacing is applied to a particular glyph, then the spacing is determined by the innermost element containing that glyph. Values other than ‘normal’, ‘none’, ‘trim-start’, ‘trim-end’, and ‘space-end’ are at-risk and may be dropped from this level of CSS. They are defined here currently to help work out a complete design of this feature. Support for this property is optional. It is strongly recommended for UAs that wish to support CJK typography. It was requested to add a value for doubling the space after periods. Typically fullwidth characters have glyphs with the same advance width as a standard Han character (e.g. 水 U+6C34). However, many fullwidth punctuation glyphs only take up part of the fullwidth design space. Thus such punctuation are not always set fullwidth. Several values of ‘text-spacing’ allow the author to control when such characters are set half-width (typically half the width of an ideograph) and when they are set full-width. add space to the glyphs if they are given half-width must be set full-width. Some fonts use proportional glyphs for fullwidth punctuation characters. For such proportional glyphs, the given advance width is considered simultaneously full-width and half-width: no space is added or removed. The advance width of a standard Han character can be determined either from font metrics such as the OpenType ideo and idtp baselines for the opposite writing mode, or by taking the advance width of a Han character such as 水 U+6C34. (The opposite writing mode must be used because some fonts are compressed so that the characters are not square.) More information on OpenType metrics can be found in the OpenType spec. Note that if 水 U+6C34, 卜 U+535C, and 一 U+4E00 do not all have the same advance width, the font has proportional ideographs and the fullwidth advance width cannot be reliably determined by measuring glyphs. Set fullwidth opening punctuation half-width if the previous character is a fullwidth opening punctuation, fullwidth middle dot punctuation, or ideographic space (U+3000). Else set it full-width. Set fullwidth closing punctuation half-width if the next character is a fullwidth closing punctuation, fullwidth middle dot punctuation, or ideographic space (U+3000). Else set it full-width. Set fullwidth closing punctuation followed by fullwidth opening punctuation each "3/4-width", i.e. halfway between fullw-width and half-width. The following example table lists the punctuation pairs affected by adjancent-pairs trimming. It uses halfwidth equivalents to approximate the trimming effect. classes and Unicode code point should be reviewed. All characters in the range of U+3041 to U+30FF, except that belongs to Unicode Punctuation [P*] category. CJK Strokes (U+31C0 to U+31EF). Katakana Phonetic Extensions (U+31F0 to U+31FF). All characters that belongs to Han Unicode Script Property [UAX24]. Is defined as Ideographic letters. Is categorized as East Asian Fullwidth (F) by [UAX11]. Is upright in vertical text flow using the ‘text-orientation’ property or the ‘text-combine’ property. Includes any opening punctuation character (Unicode category Ps) that belongs to the CJK Symbols and Punctuation block (U+3000–U+303F) or is categorized as East Asian Fullwidth (F) by [UAX11]. Also includes LEFT SINGLE QUOTATION MARK (U+2018) and LEFT DOUBLE QUOTATION MARK (U+201C). When trimmed, the left (for horizontal text) or top (for vertical text) half is kerned. Includes any closing punctuation character (Unicode category Pe) that belongs to the CJK Symbols and Punctuation block (U+3000–U+303F) or is categorized as East Asian Fullwidth (F) by [UAX11]. Also includes RIGHT SINGLE QUOTATION MARK (U+2019) and RIGHT DOUBLE QUOTATION MARK (U+201D). May also include fullwidth colon punctuation and/or fullwidth dot punctuation (see below). When trimmed, the right (for horizontal text) or bottom (for vertical text) half is kerned. Includes MIDDLE DOT (U+00B7), HYPHENATION POINT (U+2027), and KATAKANA MIDDLE DOT (U+30FB). May also include fullwidth colon punctuation and/or fullwidth dot punctuation (see below). Includes FULLWIDTH COLON (U+FF1A) and FULLWIDTH SEMICOLON (U+FF1B). Includes IDEOGRAPHIC COMMA (U+3001), IDEOGRAPHIC FULL STOP (U+3002), FULLWIDTH COMMA (U+FF0C), FULLWIDTH FULL STOP (U+FF0E). Whether fullwidth colon punctuation and fullwidth dot punctuation should be considered fullwidth closing punctuation or fullwidth middle dot punctuation depends on where in the glyph's box the punctuation is drawn. If the punctuation is centered, then it should be considered middle dot punctuation. If the punctuation is drawn to one side (left in horizontal text, top in vertical text) and the other half is therefore blank then the punctuation should be considered closing punctuation and trimmed accordingly. The UA must classify fullwidth colon punctuation and fullwidth dot punctuation under either the fullwidth closing punctuation category or the fullwidth middle dot punctuation category as appropriate. The UA may rely on language conventions and the writing mode (horizontal vs. vertical), and/or font information to determine this categorization. The UA may also add additional characters to any category as appropriate. Note, that for Chinese fonts at least, the author observes that the standard convention is often not followed. Edge effects control the indentation of lines with respect to other lines in the block (‘text-indent’) and how content is aligned to the start and end edges of a line (‘hanging-punctuation’, see also ‘text-spacing’). Japanese has three common start-edge typesetting schemes, which are distinguished by their handling of opening brackets. Value: [ <length> | <percentage> ] && [ hanging || each-line ]? This property specifies the indentation applied to lines of inline content in a block. The indent is treated as a margin applied to the start edge of the line box. Unless otherwise specified via the ‘each-line’ and/or ‘hanging’ keywords, only lines that are the first formatted line of an element are affected. For example, the first line of an anonymous block box is only affected if it is the first child of its parent element. Gives the amount of the indent as an absolute length. Gives the amount of the indent as a percentage of the containing block's logical width. Indentation affects the first line of the block container as well as each line after a forced line break, but does not affect lines after a text wrap break. Inverts which lines are affected. Note that since the ‘text-indent’ property inherits, when specified on a block element, it will affect descendant inline-block elements. For this reason, it is often wise to specify ‘text-indent: 0’ on elements that are specified ‘display: inline-block’. This property determines whether a punctuation mark, if one is present, may be placed outside the line box (or in the indent) at the start or at the end of a line of text. Note that if there is not sufficient padding on the block container, hanging punctuation can trigger overflow. An opening bracket or quote at the start of the first formatted line of an element hangs. This applies to all characters in the Unicode categories Ps, Pf, Pi. When a punctuation mark hangs, it is not considered when measuring the line's contents for fit, alignment, or justification. Depending on the line's alignment, this can push the mark outside the line box. At most one punctuation character may hang outside each edge of the line. A hanging punctuation mark is still enclosed inside its inline box and participates in text justification: its character advance width is just not measured when determining how much content fits on the line, how much the line's contents need to be expanded or compressed for justification, or how to position the content within the line box for text alignment. Non-zero start and end borders or padding on an inline box are not allowed to hang. This can sometimes prevent a hangable punctuation mark from hanging: for example, a period at the end of an inline box with end padding cannot hang outside the end edge of a line. Stops and commas allowed to hang include: U+002C COMMA, U+002E FULL STOP, U+060C ARABIC COMMA, U+06D4 ARABIC FULL STOP, U+3001 IDEOGRAPHIC COMMA, U+3002 IDEOGRAPHIC FULL STOP, U+FF0C FULLWIDTH COMMA, U+FF0E FULLWIDTH FULL STOP, U+FE50 SMALL COMMA, U+FE51 SMALL IDEOGRAPHIC COMMA, U+FE52 SMALL FULL STOP, U+FF61 HALFWIDTH IDEOGRAPHIC FULL STOP, U+FF64 HALFWIDTH IDEOGRAPHIC COMMA. The UA may include other characters as appropriate. Should other characters be included? The CSS Working Group would appreciate if UAs including other characters would inform the working group of such additions. Support for this property is optional. It is recommended for UAs that wish to support CJK typography, particularly those in the Japanese market. The ‘allow-end’ and ‘force-end’ are two variations of hanging punctuation used in East Asia. The punctuation at the end of the first line for ‘allow-end’ does not hang, because it fits without hanging. However, if ‘force-end’ is used, it is forced to hang. The justification measures the line without the hanging punctuation. Therefore the line is expanded. The following properties describe line decorations that are added to the content of an element. When specified on or propagated to an inline box, such decoration affects all the boxes generated by that element, and is further propagated to any in-flow block-level boxes that split the inline (see CSS2.1 section 9.2.1.1) When specified on or propagated to a a block container that establishes an inline formatting context, the decorations are propagated to an anonymous inline element that wraps all the in-flow inline-level children of the block container. For all other elements, the decorations are propagated to any in-flow children. Note that text decorations are not propagated to any out-of-flow descendants, nor to the contents of atomic inline-level descendants such as inline blocks and inline tables. By default underlines, overlines, and line-throughs are applied only to text (including white space, letter spacing, and word spacing): margins, borders, and padding are skipped. Elements containing no text, such as images, are likewise not decorated. The ‘text-decoration-skip’ property can be used to modify this behavior, for example allowing inline replaced elements to be underlined or requiring that white space be skipped. In determining the position and thickness of text decoration lines, user agents may consider the font sizes and dominant baselines of descendants, but for a given element's decoration must use the same position and thickness throughout each line box. The color and line style of decorations must remain the same on all decorations applied by a given element, even if descendant elements have different color or line style values. One use case we would like to support is to change color and/or style of descendants while keeping the same position and thickness. Relatively positioning a descendant moves all text decorations affecting it along with the descendant's text; it does not affect calculation of the decoration's initial position on that line. The ‘visibility’ property, filters, and other graphical transformations likewise affect text decorations as part of the text they're drawn on, even if the decorations were specified on an ancestor element. Neither produces nor inhibits text decoration. Inhibits propagated underlines and produces an underline. Each line of text has a line above it (i.e. on the opposite side from an underline). Inhibits propagated overlines and produces an overline. Inhibits propagated line-throughs and produces an line-through. Inhibits all propagated text decorations. This property specifies the color of text decoration (underlines overlines, and line-throughs) set on the element with ‘text-decoration-line’. This property specifies the style of the line(s) drawn for text decoration specified on the element. Values have the same meaning as for the border-style properties [CSS3BG]. ‘wavy’ indicates a wavy line. This property is a shorthand for setting ‘text-decoration-line’, ‘text-decoration-color’, and ‘text-decoration-style’ in one declaration. Omitted values are set to their initial values. A ‘text-decoration’ declaration that omits both the ‘text-decoration-color’ and ‘text-decoration-style’ values is backwards-compatible with CSS Levels 1 and 2. If the ‘blink’ keyword is specified the text blinks (alternates between visible and invisible). Conforming user agents may simply not blink the text. Note that not blinking the text is one technique to satisfy checkpoint 3.3 of WAI-UAAG. The following example underlines unvisited links with a solid blue underline in CSS1 and CSS2 UAs and a navy dotted underline in CSS3 UAs. Skip nothing: text-decoration is drawn for all text content and for inline replaced elements. Skip this element if it is an atomic inline (such as an image or inline-block). Skip white space: this includes regular spaces (U+0020) and tabs (U+0009), as well as nbsp (U+00A0), ideographic space (U+3000), all fixed width spaces (such as U+2000–U+200A, U+202F and U+205F), and any adjacent letter-spacing or word-spacing. Skip over where glyphs are drawn: interrupt the decoration line to let text show through where the text decoration would otherwise cross over a glyph. The UA may also skip a small distance to either side of the glyph outline. Do we need a value that doesn't skip margins and padding? Note that this property inherits and that descendant elements can have a different setting. 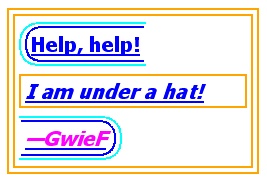 The user agent may use any algorithm to determine the underline's position; however in vertical typographic mode, if the language of the element is set to Japanese or Korean (matches :lang(ja) or :lang(ko)) the underline must be drawn on the right side of the text as described for ‘below right’. It is suggested that the underline position be ‘alphabetic’ unless it crosses either subscripted (or otherwise lowered) text, or it affects characters from Asian scripts such as Han or Tibetan, for which an alphabetic underline is too high: in such cases, aligning to the em box edge as described for ‘below left’ is more appropriate. The underline is aligned with the alphabetic baseline. In this case the underline is likely to cross some descenders. In horizontal typographic mode, this value is equivalent to ‘below left’. In vertical typographic mode, the underline is aligned as for ‘below left’, except it is aligned to the right edge of the text. If this causes the underline to be drawn on the "over" side of the text, then an overline also switches sides and is drawn on the "under" side. In some cases (such as in OpenType) the font format can offer information about the appropriate position of an underline. Typically this information gives the position of an ‘alphabetic’ underline; in some cases (especially in CJK fonts), it gives the position of a ‘below left’ underline. (In this case, the font's underline metrics typically touch the bottom edge of the em box). The UA is encouraged to use information (such as the underline thickness, or appropriate alphabetic alignment) from the font wherever appropriate. The shape is filled with solid color. Display small circles as marks. The filled dot is U+2022 ‘•’, and the open dot is U+25E6 ‘◦’. Display large circles as marks. The filled circle is U+25CF ‘●’, and the open circle is U+25CB ‘○’. Display double circles as marks. The filled double-circle is U+25C9 ‘◉’, and the open double-circle is U+25CE ‘◎’. Display triangles as marks. The filled triangle is U+25B2 ‘▲’, and the open triangle is U+25B3 ‘△’. Display sesames as marks. The filled sesame is U+FE45 ‘﹅’, and the open sesame is U+FE46 ‘﹆’. Display the given string as marks. Authors should not specify more than one character in <string>. The UA may truncate or ignore strings consisting of more than one grapheme cluster. If a shape keyword is specified but neither of ‘filled’ nor ‘open’ is specified, ‘filled’ is assumed. If only ‘filled’ or ‘open’ is specified, the shape keyword computes to ‘circle’ in horizontal writing mode and ‘sesame’ in vertical writing mode. The marks should be drawn using the element's font settings with its size scaled down to 50%. However, not all fonts have all these glyphs, and some fonts use inappropriate sizes for emphasis marks in these code points. The UA may opt to use a font known to be good for emphasis marks, or the marks may instead be synthesized by the UA. Marks must remain upright in vertical typographic modes: like CJK characters, they do not rotate to match the writing mode. One example of good fonts for emphasis marks is Adobe's opensource project, Kenten Generic OpenType Font, which is specially designed for the emphasis marks. Characters belonging to the Unicode classes for control codes and unassigned characters (Cc, Cf, Cn). If emphasis marks are drawn for characters for which ruby is drawn in the same position as the emphasis mark, the ruby should be stacked between the emphasis marks and the base text. In this case, the position of the emphasis marks for a given element should be determined as if all characters have ruby boxes of the same height as the highest ruby box in the element. If the UA is not capable of drawing ruby and emphasis marks on the same side, the UA may hide ruby and draw only emphasis marks. A future level of CSS may define controls to specify what to do when emphasis marks and ruby text coincide. This property describes the foreground color of the emphasis marks. This property is a shorthand for setting ‘text-emphasis-style’ and ‘text-emphasis-color’ in one declaration. Omitted values are set to their initial values. Note that ‘text-emphasis-position’ is not reset in this shorthand. This is because typically the shape and color vary, but the position is consistent for a particular language throughout the document. Therefore the position should inherit independently. Draw marks over the text in horizontal typographic mode. Draw marks under the text in horizontal typographic mode. Draw marks to the right of the text in vertical typographic mode. Draw marks to the left of the text in vertical typographic mode. Emphasis marks are drawn exactly as if each character was assigned the mark as its ruby annotation text with the ruby position given by ‘text-emphasis-position’ and the ruby alignment as centered. The effect of emphasis marks on the line height is the same as for ruby text. This section is under brainstorming. Skip punctuation. Punctuation in this definition includes characters belonging to the Unicode Pc, Pd, Ps, Pe, Pi, or Pf categories. It also includes characters where the Unicode category is Po and the Sentence_Break property [UAX29] of the Unicode database [UAX44] is ATerm, Close, SContinue, or STerm. Skip symbols. Symbols in this definition includes characters belonging to the Unicode S* category. It also includes the Unicode Po category that are not defined as ‘punctuation’ above. Skip characters where the East_Asian_Width property [UAX11] of the Unicode database [UAX44] is not F (Fullwidth) or W (Wide). Characters belonging to the Unicode classes for control codes and unassigned characters (Cc, Cf, Cn) are skipped regardless of the value of this property. This syntax requires UA to implement drawing marks for spaces. Is there any use case for doing so? If not, should we modify the syntax not to allow drawing marks for spaces? This property accepts a comma-separated list of shadow effects to be applied to the text of the element. <shadow> is the same as defined for the ‘box-shadow’ property except that the ‘inset’ keyword is not allowed. The shadow is applied to all of the element's text as well as any text decorations it specifies. Unlike ‘box-shadow’, text shadows are not clipped to the shadowed shape and may show through if the text is partially-transparent. Like ‘box-shadow’, text shadows do not influence layout, and do not trigger scrolling or increase the size of the scrollable area. The painting order of shadows defined here is the opposite of that defined in the 1998 CSS2 Recommendation. The ‘text-shadow’ property applies to both the ::first-line and ::first-letter pseudo-elements. A style sheet is conformant to CSS Text Level 3 if all of its declarations that use properties defined in this module have values that are valid according to the generic CSS grammar and the individual grammars of each property as given in this module. An authoring tool is conformant to CSS Text Level 3 if it writes style sheets that are syntactically correct according to the generic CSS grammar and the individual grammars of each feature in this module, and meet all other conformance requirements of style sheets as described in this module. This specification would not have been possible without the help from: Ayman Aldahleh, Bert Bos, Tantek Çelik, Stephen Deach, John Daggett, Martin Dürst, Laurie Anna Edlund, Ben Errez, Yaniv Feinberg, Arye Gittelman, Ian Hickson, Martin Heijdra, Richard Ishida, Masayasu Ishikawa, Michael Jochimsen, Eric LeVine, Ambrose Li, Håkon Wium Lie, Chris Lilley, Ken Lunde, Nat McCully, Shinyu Murakami, Paul Nelson, Chris Pratley, Marcin Sawicki, Arnold Schrijver, Rahul Sonnad, Michel Suignard, Takao Suzuki, Frank Tang, Chris Thrasher, Etan Wexler, Chris Wilson, Masafumi Yabe and Steve Zilles. Removed ‘hyphenate-resource’ property / ‘@hyphenate-resource’ rule. Merged ‘text-trim’ and ‘text-autospace’ into ‘text-spacing’. Added ‘<length>’ values to ‘tab-size’ (at-risk). Removed ‘all’ value of ‘hyphens’ property. Changed ‘text-decoration-line’ value syntax for cancelling ancestor text decorations. Removed suggestion to inset decorations from the content box edges in favor of an explicit ‘edges’ value for ‘text-decoration-skip’. More precise definition of a "character"/grapheme cluster and its properties. Specified order of text operations. Added more details on case mapping, fullwidth mapping, and small kana mapping. Removed interaction of white space collapsing and ‘text-autospace’. Cleaned up details on ‘line-break’. Significant tweaking to ‘text-justify’ prose to make it clearer and more coherent. Replaced parts of ‘text-shadow’ description with pointer to ‘box-shadow’. This appendix is informative, and is to help UA developers to implement default stylesheet, but UA developers are free to ignore or change. If you find any issues, recommendations to add, or corrections, please send the information to www-style@w3.org with [css3-text] in the subject line. This appendix is informative (non-normative). Typographic behavior varies somewhat by language, but varies drastically by writing system. This appendix categorizes some common scripts in Unicode 6.0 according to their justification and spacing behavior. Category descriptions are descriptive, not prescriptive; the determining factor is the prioritization of expansion opportunities. Scripts that have discrete units but do not use spaces between words, such as many Southeast Asian systems. The following scripts are included: Khmer, Lao, Myanmar, Thai, This list is likely incomplete. What else fits here? Scripts that use spaces or visible word-separating punctuation between words and have discrete, unconnected (in print) units within words. The following scripts are included: Armenian, Bamum?, Braille, Canadian Aboriginal, Cherokee, Coptic, Cyrillic, Deseret, Ethiopic Greek, Hebrew, Kharoshthi, Latin, Lisu, Osmanya, Shavian, Tifinagh, Vai? UAs should treat unrecognized scripts as discrete. This listing should ideally be exhaustive wrt Unicode. Please send suggestions and corrections to the CSS Working Group. If the script is cursive and may expand cursively but must not space between letters, it is cursive. If the script primarily flexes word separators, it is either discrete or connected. Discrete scripts can space between letters. Connected scripts must not space between letters (typically because that would break the connections or otherwise look bad). If the script primarily expands equally between its "letters" in native typesettings, it is either block or clustered. The exact classification depends on whether it always spaces when mixed with CJK and sometimes stays together when mixed with Thai and related scripts (block) or sometimes spaces when mixed with CJK and always spaces with Thai (clustered). Some features are more important in some typographic traditions than in others. This table summarizes which typographic traditions these features were designed for. Parentheses indicates traditions for which the feature is particularly significant. This table should be considered incomplete and non-exhaustive. Additional information / corrections on this table are welcome.